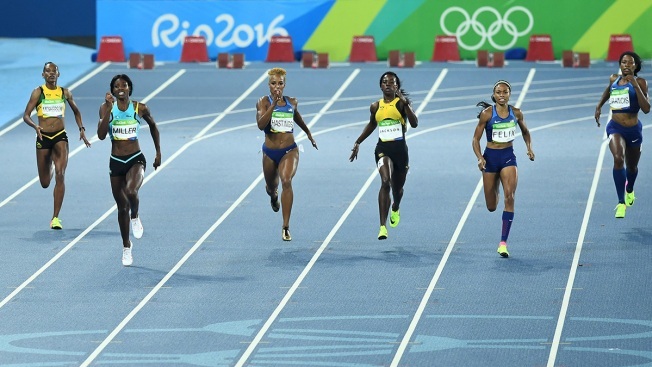 Jamaica's Stephanie Ann Mcpherson, Bahamas's Shaunae Miller, USA's Natasha Hastings, Jamaica's Shericka Jackson, USA's Allyson Felix and USA's Phyllis Francis compete in the Women's 400m Final during the athletics event at the Rio 2016 Olympic Games on Aug. 15, 2016. Two of the finest young sprinters in the world exploded from the blocks on Monday night in pursuit of one of the most coveted prizes in track and field: the Olympic gold medal in the women’s 400-meter dash. American Phyllis Francis, a 2014 University of Oregon alumna, and Bahamian standout Shaunae Miller, a 2013 star at the University of Georgia, were both peaking at the just right time in their blossoming careers. In the end, it was Miller who took gold, with a time of 49.44. Francis was fifth at 50.41. Francis’s personal-best time of 49.94 seconds in Eugene, Oregon, on July 3 was the second fastest of the Olympic Trials, trailing only Allyson Felix’s 49.68. Those times not only earned Felix and Francis spots on the U.S. Olympic roster, they were also the second and third fastest recorded in the women’s 400 this year, trailing only Miller’s 49.55 in London in July. From the heartbeat of New York City, in Laurelton, Queens, Francis learned the power of perseverance at a young age. The 24-year-old Francis was hitting her stride at just the right time as Rio neared. In addition to a personal best in the 400 at the Olympic Trials, this year Francis enjoyed a personal best in the 200 meters with a time of 22.50 seconds in July in Houston, and her 100-meter time of 11.34 in Eugene, Oregon, in May was also her fastest ever. "I know I'm a lot stronger than I was last year, and faster, so I can't wait to surprise myself," the 5 foot 10 inch Francis told the Register-Guard. 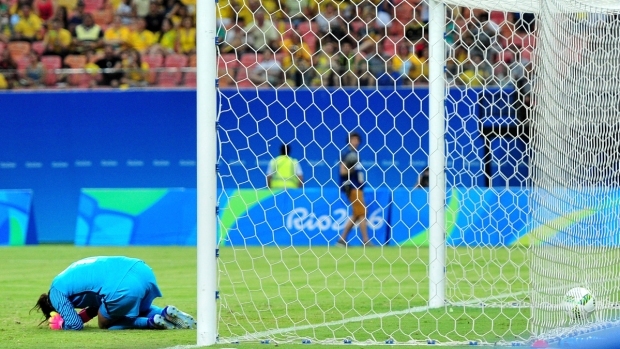 This Olympics was not the first time these two young stars have faced one another in international competition. In the 2015 World Championships in Beijing, Miller earned a silver in the 400w with a then-personal best time of 49.67, while Francis ran 50.51, good for seventh. In 2014, Francis became the first University of Oregon woman to win a 400- meter NCAA title for the Ducks, as she set an indoor record with a time of 50.46 seconds, breaking the mark set in 2010 by fellow U.S. 4x400 meter relay team member Francena McCorory. Miller earned first-team All-American honors in the 400 during her only year as a Georgia Bulldog in 2013, when the freshman ran 50.70 in the final of NCAA Outdoor Championships. That time was good enough for second in the nation, just ahead of Francis’s 50.86. Ashley Spencer of Illinois won the title with a time of 50.28. In July 2013, Miller decided to forgo the remainder of her amateur eligibility in order to join the pro circuit. It is a decision that has served her well. Though just 22, in July the Nassau native won the Bahamian Icon Award for Sports. The 6 foot 1 inch Miller took the honor in stride, citing the recognition as cause for inspiration. “Something like this only motivates me to train harder and go out there and compete stronger,” Miller told the Nassau Guardian. “I’m so thankful for all of the support. I have a lot of kids looking up to me as well, so I have to go out there and represent well for them and for the Bahamian people. I’m really excited for the Olympics, and going out there and seeing what I could do." "The time that’s going to win [the 400] will probably be a 48," Miller continued. "We’re going to go for it."